As Irish water continue to hop from one PR disaster to another we are keen to help you ensure that you pay them as little money as possible by including a free 5 minute showertimer when you spend 50 Euro or more on a transaction. The showercoach is an hourglass style shower timer similar to an egg timer. It has a suction cap so it can be easily installed on the wall of your shower and the grain within it takes five minutes to go from one side to the other. It normally retails at €6.95 but is free before the end of October 2014 when you insert the discount coupon code freetimer at checkout or call 01 8428187 and quote the code if you would prefer to order over the phone. 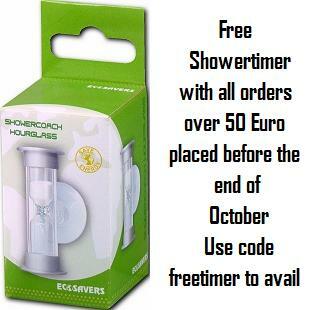 2: We will not be sending the free shower coach on orders less than €50 even if the code is used. However you will get a 1 cent reduction on the cost of your order. What savings can be achieved with a shower timer? If your shower head has an output of 12 litres per minute and the showertimer helps to reduce the average shower in your home from 8 minutes to 5 minutes you can save 36 litres of water per person per home every time you shower. In a home of 4 people this translates to a saving of 52,560 litres or €259.49 per annum. 8 Reasons to Pay Irish Water as little as possible. View Ireland’s most comprehensive range of water saving products.